Q. How important is social media in the cross-stitch industry and how do you make use of it for your company? What are some of the biggest changes in the industry you’ve seen since you began designing? A. Because I have been designing for more than 36 years (! ), I have seen SO very many positive changes! From a designer’s perspective I would say the one that is most obvious is the computer—from the ease of researching subject matter on the internet to the design software that makes it so much easier to create a professional looking leaflet. When I first started, I had NO graphic experience at all. It was months before I realized I could have my printing company produce graph paper for me with a large enough grid to easily draw in the symbols, then reduce the artwork to fit onto a standard size page. MUCH easier than trying to draw in those teeny symbols on a small grid! I also had to learn that I could rechart small areas of the design by cutting and pasting over errors rather than redraw the entire chart. The word processor was unheard of and I didn’t even own a typewriter to write the instructions! I hand drew the symbols and hand wrote the instructions…I was so inexperienced. In today’s world, the software makes it so easy to create a professional product, and in a fraction of the time. I even do my own leaflet printing now. I think I love creating the layouts as much as I do the actual design. On the flip side is the ease in which the computer allows copyright infringement. This issue is such a discouragement to designers. The industry itself is waning because stitchers rarely have the time to stitch they did when most were stay at home moms 20-30 years ago, but the stitchers that are left have such easy access to copied charts. There are huge clubs out there that a stitcher can “join” by bringing a handful of her purchased patterns to scan and share on the sites of thousands of other copied patterns there for the taking. I have found sites with every pattern I have ever created, some within days of publication. A few of the sites can be shut down, but only until the owner renames and reposts. Designer organizations try to educate the infringers and some do “get it” but many think it’s a game to outwit us. For me, this is the issue that some days, just makes me want hang up my needle. Social media is a double edged sword. Because of the reasons listed above I hate it! I also love it because I can easily get the word out quickly when I have a new design. Mostly I post about new products to message boards I belong to. All the social media efforts take a LOT of time and talent…I am still trying to figure out Facebook! I am pretty much a one man band. I design, work with model stitchers, do the layouts and printing of leaflets, inventory control, general office work, etc. I do have an office manager, but her job is shop contact and order fulfillment. Neither of us is very computer savvy when it comes to social media. I can’t afford to have a person who can promote me on the social media sites and it takes me SO much time when I try it myself…and then I stop blogging and people email me to see if I am still alive! LOL! A. I have to have my designs stitched by model stitchers. I rely on them to find any errors. When I try to stitch my own designs, I know which way the chart is supposed to go so my needle just seems to stitch on its’ own without following the chart. If there are errors, or the instructions are confusing, I don’t see it. A. I don’t remember doing needlework until I was newly pregnant and made a few bibs and gowns for my baby…they were stamped cross stitch and the materials were readily available in the local dime stores. When I was a child, I did a lot of crafts through Girls Scouts and I sewed a lot of doll clothes for my Betsy McCall doll. Betsy was always beautifully dressed, at least from the front view. If you turned her over, you would see all the short cuts, pins and tape holding her lovely clothing together! My mother sewed all her own clothes and really understood construction and tailoring. I remember her taking college sewing classes, and I would even get compliments on how beautiful her clothing was. Every summer I took sewing classes from the local Singer Sewing Center. At the end of the summer, we would have a tea and fashion show. I must have been pretty good at it, and I expect I finished the backs of my own dresses since I usually got awards! A. I did crewel embroidery as a young adult. I found patterns in the Stitchery catalog but there were not very many crewel kits that appealed to me. I could draw and I tried to create my own patterns but I was stumped when it came to deciding which stitch to use to fill in the areas. And I didn’t even know there were shops to get fibers to stitch with! I was trying to use leftover wool from the crewel kits so that was pretty limiting. Finally I just gave up. Several years later, I took a welcome gift to a new neighbor and she was working on a counted cross stitch project. Wow! I was immediately hooked! This was in 1976 and cross stitch was just beginning to become known and there weren’t many shops to get patterns. So I gave designing another try…this time though, the stitch was already decided for me! I could design all I wanted and the fill-in was all the same! Everything just fell into place! In those days, there were no color leaflets. There were only charts and the stitcher didn’t even know how the picture would look before she started the project so it was always a surprise! For the designer, it was certainly a small investment to produce a black and white chart. I began charting family homes for stitchers and gained confidence with that, eventually branching out to historic Virginia landmarks which was my foot in the door with shops. Q. Do you or are you willing to travel for stitching events? I pick and chose around our family schedules but I do try to visit shops and participate in stitch-ins and get-togethers as often as I can. Gingerbread Street which has four designs and can be stitched individually or in its' entirety. Fun to stitch, uses 6 strand floss and Blending filament for a bit of sparkle! Q. None of us are perfect – tell us about something that embarrassed you. on myself, I eventually realized I was pretty smart! My very first book (black and white of course!) was published in 1977 by a local printer who believed in me more than I did myself--he extended me credit in my business name and I was worried about paying him back. The book was Historic Virginia, a compilation of 16 Virginia buildings. Although I am not a native Virginian, when I moved here as a young military wife I learned quickly that Virginians have a great sense of tradition and loyalty to their wonderful state. I knew they would buy the book! In the state to call their own…it was geographically balanced. So the book was published and I was so very proud of it! I had spent considerable time in the local library making lists of craft and needlework stores throughout Virginia and nearby states. I created the lists by looking through the yellow pages (remember those?) and putting shop names, addresses, and phone numbers on index cards. I had hundreds of listings. As soon as Historic Virginia was picked up from the printer’s, I sent out a sample of the book, along with a cover letter introducing myself to every shop on my list. And then I waited for the orders to roll in. And waited…and waited. Nothing! Not one order in three weeks! I would pack up my kids and go check my post office box twice a day (not realizing that the mail goes up just in the mornings.) I was worried that I had spent my family’s money and still owed the printer for this foolish venture! I had one last idea and I was too embarrassed to admit to it. I would start calling shops and pretend to be a stitcher asking about this wonderful new book and did they stock it. I was pleasantly surprised that just about all the shopowners said they have seen it, planned to order it, or already had but “the designer was slow in shipping to the shop!” Soon the orders began to roll in. The book sold like crazy and I was able to repay my printer, I made a tidy profit, and I was on my way! A. I think I have a lot of hobbies. I love to create and recreate my home décor. When I was a young teen, I babysat in a house where the Mom decorated with “old stuff” that she had re-purposed into something fun and whimsical and that inspired me. I love to go “junking” and have had many successful purchases that started out dirty and dusty and ended up in a place of honor in our home. Great for conversation starters when entertaining. I love spending time in the kitchen, sometimes just reading cookbooks! Now that the children are grown and out of the nest, I don’t cook and bake as much as I once did…although the best “eater” of my kids lives just a couple miles down the road so the leftovers don’t go to waste. Testing new recipes is always fun. Traveling and cruising is a great enjoyment. Being a workaholic, my husband has recently started making the time to whittle down his very long bucket list and we have to keep up with it or we won’t be able to finish it all while still upright. I really don’t have much on my list, I started traveling earlier than he did! a “cottage look” which in my mind is a very informal look…like someone has just thrown color together and it just “works” but I am now smart enough to know it takes a LOT of time and effort to get that natural look. Q. If you could be an animal, which would you pick and why? A. A cat! But not just any cat, I would want to be one of MY cats! My cats, Lucy and Ethel, want for nothing. My husband and I are there for them. We have a large patio and when they want to go out, they go stand by the door and one of us will hop up and open the door and let them out, and in, and back out, and back in…it’s continual. Even during the night! If we happen to sleep through their demands, they will walk on us until we can’t stand it any longer and get up to let them out. Their food and water bowls are always full, we pass out treats on demand, their litter boxes are always clean. They never say “thank you, we appreciate your service.” They DO however, let us pet them while they purr…they bring us toys so we can play with them, they snuggle with us when we are reading or watching TV, they spoon with us when we sleep. And we are happy to serve them! Q. Greatest strength and biggest weakness? A. For sure the biggest weakness is taking on too much…I have a hard time saying “No, thanks for asking, but I just can’t.” I often have deadlines that crash into each other. I procrastinate if I have too much time, and then all of a sudden what I had on my calendar one day is superceded by a lost trunk show and that causes a chain reaction that now beyond my control. I am so much better at organizing than I used to be, but to be forced to go to plan B, or C, or beyond, is very stressful. I am sure age is involved but knowing the reason for the stress doesn’t ease it! A. I actually started doing counted cross stitch on the way home from a trip to Florida in 1976. 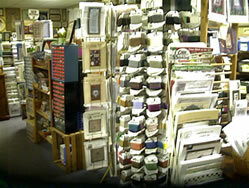 We stopped at Williamsburg, Va and a little shop there had kits of the homes done on Hardanger fabric. Not knowing any better, I purchased a few kits, and told them that if I understood what I was doing, I would call and order the rest. Well by the time I got home I had them done and was hooked. Then when I went to Sturbridge, MA, I saw the same kits of the homes located there. Since they did not have all of them, when I got home I contacted the designer, Traditionals by Tricia, and became her model stitcher for over 5 years until my children were born. A. I actually started my business February 3, 1984. I had a business background, so starting a business was not a problem. Having two children, I wanted to be a stay-a-home Mom, and thought I could have a nice mail order business as that was how I purchased my counted cross stitch supplies. Within a month I had customers coming to my door looking for supplies. 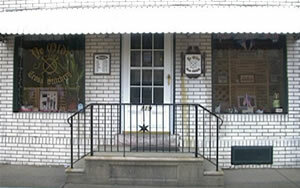 I was fortunate that I had a building behind my home that I was able to convert into a small shop. Within four years, I started looking for a larger building. With both children in school, I found my current location, rented for 4 months, then purchased the building. I went from mail order to full service shop with mail order. Q. Do you have an online web store, and if so how do you feel it has affected your business? A. I fought the internet for many years, as I felt that customers would prefer to come into a shop to make their purchases. I had heard horror stories about customers being ripped off as well as shops being taken over by web customers, and just didn't want to deal with this type of business. However, over time we were getting floss and fabric sales in the shop, but customers were purchasing their books and kits on the web. They would say, I didn't know you had such and such book, but they never called before they made a web purchase. So I started to rethink my objections, and 6 years ago found a web master in South Carolina who understood what I wanted, and after three months started a web store - http://www.yedoldecs.com/. I can honestly say it has affected our business in a very positive way. Since I started before the economy crashed, we were established from day one, and continue to give the same service that we give to our shop customers. As with any customer, you cannot please everyone all the time, but we try out best to accommodate everyone. Our business has grown steadily every year since we started our web store, and have many returning customers. A. When I started, most people stitched on 14 Ct. White and Ivory, or 25 Ct, and 27 Ct. Linen in White, Ivory, and Raw. It was a treat teaching people to branch out and try something new. Everyone was scared to try linen and evenweave fabrics Colored fabrics were not that available, and DMC floss was the floss of choice. Then we had a time when beading was hot. Since hand-dyed floss entered the market, everything has changed, and now we also have hand-dyed fabrics. I think the cost of the inventory that is now needed to accommodate everyone is very hard for some businesses to handle. To be successful, you now need to stock an array of fabric counts and colors, many lines of hand-dyed flosses and hand-dyed fabrics, DMC and Anchor floss, buttons, beads, and items that the designers use in their patterns. Customers want what the designers use, and most are afraid to change a thing. Same time goes for shops who have models - customers like what they see and want to do their pieces the same way. Q. How important is social media in the cross-stitch industry and how do you make use of it for your company? A. Since I have many hats - running the shop, mail order business, handling the Web Shop, and stitching models, time is very valuable to me. I post and send a monthly web newsletter, send a bi-monthly newsletter to the mail order customers who do not have a computer, answer all e-mail timely, and have a Facebook page where I post info that I feel is important to keep customers informed of new products, designers, and other related news. Customers like to be kept abreast of changes just like they would do if they visited a shop. 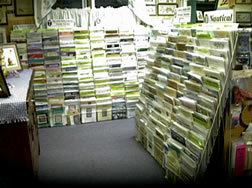 E-mailings and Facebook have been working for our shop and I find customers look forward to our mailings. A. When I can sneak away from the shop - I enjoy traveling, going to the beach, visiting with friends and family, going out to dinner, and just relaxing. A. I like easy listening. We have a local radio station, B101, that I listen to in the shop all the time. I think I even converted customers to their format. Songs range from Adele, Kelly Clarkson, Carrie Underwood, Bee Gees, Sugarland, Taylor Swift, Beach Boys, Maroon 5, Kati Perry, and Lady Antebellum, just to name a few of the artists. A. I have been married to Rich, owner of Mercury Press Printing, for 41 years, and am the mother of two - Shana who is 30, a Web Marketer for an Insurance Publication, and single; and Shawn who is 29, works for a POS computer company, married, and the father of two - Candence 3, and Liam 1. Customers who visit the shop have met my grandchildren as I have the pleasure of babysitting them 4 days a week and they go to work with me three of the four days. My granddaughter loves to greet the customers and wants to work in the shop when she gets bigger. A. Since I am of Italian descent - I'm a pasta lover. Any type of pasta, good meat sauce, meat balls, Italian bread, and a salad is my favorite meal. A. Since I take in all strays, I could never work for a vet. I've been a dog lover since I was a child when our dog had her litter on my birthday. Then I married a cat lover, so we then started with a dog and cat. At one point I had three dogs, and four cats. I now have Bootie the cat, and two dogs - Rusty, a chocolate lab that was given to me, and Stitches, a black lab. I did not name Stitches, that was her name when we purchased her from a breeder along with her sister Goldie, who passed away at the age of two from bone cancer. Most animals just come to my door step, and then they become a member of the family. I passed the gene along to my children as my daughter has two cats, and my son has three Pomeranians, one who resides at my house for now. Also, we have a tank of fish that started when my son was a young child, and Dad maintains. I just wanted to thank you for producing these newsletters - I love hearing how my favorite designers and stores got started. Keep up the great work!